Hiddink only lasted 10 months in the manager’s role, losing more than half of his games in charge. Hiddink had a poor record with the Dutch this time round. GUUS HIDDINK HAS quit his job as manager of the Netherlands following a string of poor performances throughout his 10 months in charge. The Dutch man took over following Louis Van Gaal’s departure from the national side last August, but he was never able to provide consistent results as the Oranje slumped to third in their Euro 2016 qualifying group. Danny Blind, father of Machester United midfielder Daley, will take over the reigns as national team coach in Hiddink’s absence. He was the former Chelsea boss’ assistant during his time in charge, but was already due to take over the Netherlands’ side following the European championships. The Dutch are five points behind group leaders Iceland in Group A, and a three adrift of second-placed Czech Republic. The Netherlands’ only wins in qualifying have come against Kazakhstan and Latvia, while they dropped points to Turkey, Iceland and Czech Republic. Since taking over, Hiddink has guided last year’s World Cup third-placed team to just four wins in 10 games, registering five defeats and a draw along the way. Hiddink announced last night that he was sorry for the team’s poor performances in his time in charge, and wished his successor all the best. “I am sorry that it went this way,” said Hiddink. It’s a poor end to his second reign as Netherlands manager. The Dutch reached the semi-finals of the World Cup under his stewardship in 1998. Email “Holland turn to former defensive great as Hiddink quits as boss”. 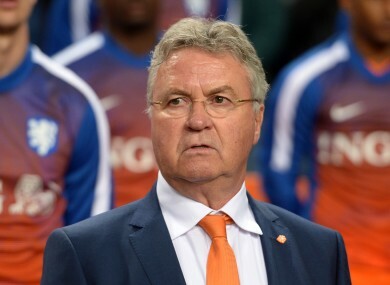 Feedback on “Holland turn to former defensive great as Hiddink quits as boss”.